The world is moving towards a more ergonomic working environment for great reasons! This keyboard and mouse tray is adjustable and features a gel wrist pad that will allow you to work in a comfortable, healthy position. Doing so will help prevent workplace injuries that can occur from repetitive strain actions. Moving and adjusting the under desk keyboard tray is a breeze so you can get back to working on the important stuff. We want your whole experience with this keyboard tray to be enjoyable, so we have made the process even easier by including all of the hardware and instructions that you need for setup! 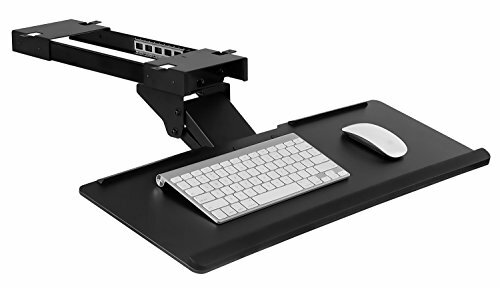 FULL MOTION DESIGN - You have the ability to tilt, swivel, and raise this keyboard mouse tray to a position that is suitable and comfortable for you. Adjust the drawer to an angle that is easier on the wrists! ERGONOMIC - Work in a healthier position by utilizing the gel wrist pad that comes with this computer keyboard drawer. Adjusting the height and angle along with using the gel pad will help with arm and wrist strain, preventing repetitive stress injuries such as carpal tunnel and arthritis. HEAVY DUTY MATERIALS - Enjoy this under desk keyboard drawer for years to come since it is made with heavy duty, quality materials. All of the materials that are needed to install this keyboard tray are included. SPACE SAVING - Whether you have a small or large desk, it is always important to utilize the space wisely to get the most out of your work. This computer keyboard tray will instantly increase your space since it sits beneath the desk you are working on. SLEEK AND MODERN DESIGN - This keyboard holder will go well with any style desk, and fits a variety of keyboards! The sleek and modern design makes it very versatile, and it will not clutter up your workspace. View More In Furniture Accessories.